A 100% UNauthorized GOODNIGHT MOON parody as only the world-(in)famous MAD Magazine can do it! Batman may be ready for bed but crime never sleeps! And before the Caped Crusader can turn in for the night, he ll have to deal with villains like the Joker, Bane, Mr. Freeze, Catwoman and the Penguin! If the Dark Knight ever hopes to catch some z s, he ll have to catch Gotham s most dangerous criminals first! In this all-new story from the Usual Gang of Idiots at MAD Magazine, the best-selling children s book GOODNIGHT MOON is parodied with the heroes and villains from the world of DC Comics BATMAN!" “Goodnight, Batcave” is a clever parody of the beloved children’s book “Goodnight, Moon” that will amuse almost any Batman fan. While meant for adults, the illustrations and rhymes contain no objectionable content for little superheroes. It could be a fun bedtime reading departure from the usual. Just what is your cat thinking? As it gazes up at you, are those eyes filled with love and admiration or spite and scorn? From the author of the award-winning 101 Uses of a Dead Kindle and If Dogs Could Swear comes a hilarious insight into the twisted, venal, self-serving psychology of our cutest four-legged sociopaths. Catology is a psychiatrist's view of your moggy, a brilliant, unforgettable and twisted look at the many bizarre, ridiculous and instantly recognisable scenarios in which cat owners find their beloved pets every day. 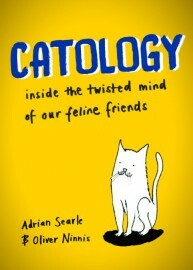 “Catology” made me laugh so hard I kept snorting. It is a perfectly dark view of cat psychology told through cartoons. It would make the perfect holiday gift for a friend or loved one who loves cats but recognizes that they can be devious and cunning creatures. It is definitely an adult book, so keep that in mind. Highly recommended for a laugh! From the legendary New York Times bestselling author of The Flowers in the Attic and My Sweet Audrina series comes the first book in a new series featuring identical twin sisters made to act, look, and feel truly identical by their perfectionist mother. 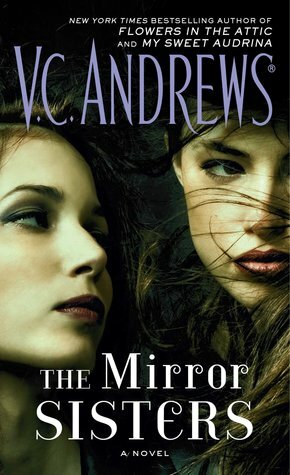 “The Mirror Sisters” is the beginning of a new series in the long line of V.C. Andrews novels. Haylee and Kaylee are what you expect from V.C. Andrews characters: wealthy, beautiful, really really screwed up mother. In other words, everything those of us who have read the novels since “Flowers in the Attic” have come to know and love. The plot premise also follows in the creepy family vibe with a mother who takes the word “identical” way too literally when it comes to her girls. Unfortunately, almost the entire book felt like it was building up to something way bigger than the climax. It was a letdown. That being said, I will still read the next in the series and hope that it lives up to its promise. “The Mirror Sisters” is recommended for anyone who enjoys V.C. Andrews books. No content warning as I still view V.C. Andrews novels as adult books. Still, it’s a V.C. Andrews book. I’m sure you can figure out the content. “Labyrinth Lost” is a fun adventure revolving around a bruja and her friends. I loved the rich world that the author built-in the alternate dimension Alex and her friends found themselves in. It was imaginative and seemed to pop right off of the page. The plot moved quickly, making it a very quick read. My only problem is that there is one plot point well-developed throughout the book with a sudden twist that made zero sense thrown in at the end. I get wanting the element of surprise, but the author should have given at least a bit of development to the twist if that is where she wanted to go. As written, it seemed like an afterthought. I wish I could further explain but don’t want to give away any spoilers. “Labyrinth Lost” is a good start to a series about magic and adventure. I recommend it to anyone upper middle school and up looking for a fun, fast read. Seventeen-year-old Catherine Pulaski knows Zero is coming for her. Zero, the devastating depression born of Catherine's bipolar disorder, almost triumphed once; that was her first suicide attempt. Being bipolar is forever. It never goes away. The med du jour might work right now, but Zero will be back for her. It's only a matter of time. And so, in an old ballet-shoe box, Catherine stockpiles medications, preparing to take her own life before Zero can inflict its living death on her again. Before she goes, though, she starts a short bucket list. The bucket list, the support of her family, new friends, and a new course of treatment all begin to lessen Catherine's sense of isolation. The problem is, her plan is already in place, and has been for so long that she might not be able to see a future beyond it. This is a story of loss and grief and hope, and how some of the many shapes of love--maternal, romantic, and platonic--affect a young woman's struggle with mental illness and the stigma of treatment. “The Weight of Zero” is an accurate portrayal of what life with mental illness is like for teenagers. Catherine, the main character, has bipolar disorder. Her struggle to accept it and find a way to live with it is the driving plot of the book. There are no miracle cures and romance won’t “cure” her. It is easily one of the most accurate portrayals of mental illness in YA literature that I have ever read. It’s also a very easy read in spite of the grit. I recommend “The Weight of Zero” for anyone looking for a realistic portrayal of mental illness. It would be a good discussion starter between parents and their children, as well.